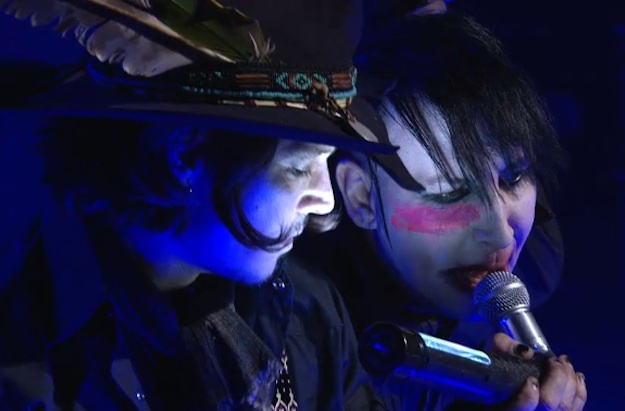 Marilyn Manson recently performed live with some help from special friends Johnny Depp (Tim Burton’s Dark Shadows and nearly every other male Gothic character on film) and Taylor Momsen (Gossip Girl and The Pretty Reckless) at the Revolver Magazine Golden Gods Awards 2012. Opting for simple Gothic whiteface accentuated by a rough pink smear on his cheek, Manson’s style is looking more and more like his paintings, which I wholly approve of. Posted by C.Noir on April 21, 2012. Filed under Events, Video. You can follow any responses to this entry through the RSS 2.0. Both comments and pings are currently closed.